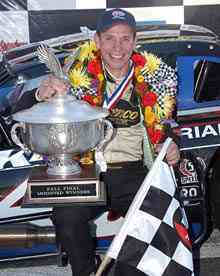 Tony Hirschman won the Fall Final at Stafford Motor Speedway and Donny Lia finished second. How the two got there couldn’t have been more opposite. 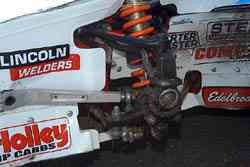 Hirschman babied his #48 car through the race, Lia drove the wheels off his #18 – literally. Hirschman crossed the finish line without so much as getting his car sideways and reported straight to victory lane. Lia lost his left front wheel going into turn three of the final lap, kept his foot to the floor, crossed the start-finish line in a shower of sparks and spun his tri-wheeled wonder right after making it past the line. He had to be towed to the tech area. Hirschman won the outside pole for the race and started third after the redraw. Lia won the pole position, but missed the driver’s meeting and started at the rear of the field. And in the end, these two very different approaches led to very similar finishes. Hirschman showed once again that he could adapt to any type of race around him and Lia showed that he just won’t give up at all. 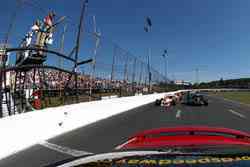 The race played right into Hirschman hands when it went clean and green for the final 95 laps. He was leading on lap 49 when a caution came out for a spin by Zach Sylvester. Hirschman, along with six other lead lap cars decided that it was too early to pit for new tires and stayed on the track. Lia made the more-popular choice to pit for tires and came out of the pits first, but was eighth on the track. Without the benefit of another caution, Lia would only be able to catch the leader by running him down the old fashion way and the other lead lap cars would not have a chance to pit for tires before the end. While several of those drivers told Speed51.com that they would have taken on new tires even with as little as five laps to go, Hirschman wasn’t really concerned about missing out on a chance to take new rubber. While other drivers were holding on to their sliding cars on old tires, Hirschman actually enjoyed his ride to the end. How much does having a veteran driver help when it comes to conserving tires. As usual, Hirschman took little credit for himself when asked about that, but the sly veteran had to admit that he did play some role in it. As the laps ticked down, Lia was getting closer to Hirschman, but ran out of laps to catch him. Hirschman ran the entire 150 lap race without pitting for tires. Lia pitted at the one-third mark and his team put him out front of everyone else who came down pit road. Hirschman’s day was all about maintaining what he had. Lia’s was to have to reach out and pull in what he could get. Lia might have needed more laps to catch Hirschman, but he was glad that the race ended on lap 150. After all, his wheel assembly sheared off with two turns to go, bounced off his hood, into the parking lot and onto a parked vehicle. Lia peddled his #18 to the line in second, holding off Chuck Hossfeld, Jerry Marquis and Ted Christopher with only three wheels. The lack of a caution to make up ground might have hurt Lia’s chances at a win, but he couldn’t predict that for sure. After all, a driver who finishes second on three wheels knows not to question fate. With his victory and point leader Ted Christopher’s fifth place finish, Hirschman gained a few points in the Modified Tour championship battle. TC now leads Hirschman by 36 entering the final two Modified events of the season, both at Thompson over the next few weeks. Speed51.com will have more from Stafford in our leftovers, later this week.